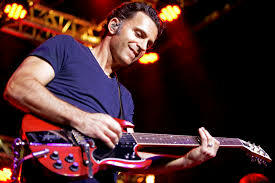 Dweezil Zappa joins us to speak guitar in the lead up to his Feb 2018 tour of Australia and New Zealand. The tour - "Dweezil Zappa - celebrating 50 years of Frank Zappa" - continues the honouring of Frank's musical legacy that commenced when Dweezil started playing shows of his father's music in 2006. Dweezil talks us through in depth on the work that goes into choosing repertoire and rehearsing, the impact that Frank's music has had on his guitar playing, running masterclasses, live rigs and upcoming solo projects.